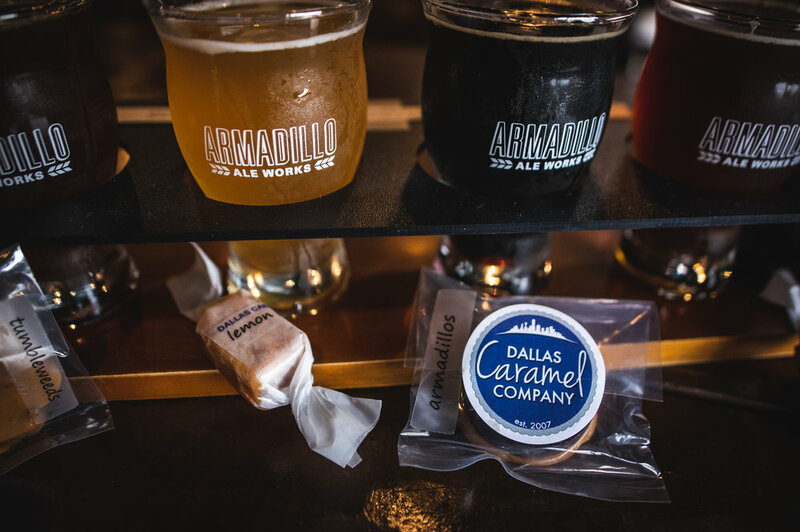 Adding yet another adorable “micropairing” to its list, Armadillo Ale Works teamed up with local confectioner Dallas Caramel Company to celebrate the classic treat with a beer pairing. No pretenses were held here: this was nothing short of a simple and sweet pairing that even the most modest or innocent of participants could partake in, taking little time or money to be a part of. We delved into the sugary goodness last Thursday evening, spoiling our dinners with such desserts like the adults we are. The Dapper Apple is a sliced crisp, cinnamon apple pie heavy with nostalgia, but finishing clean as a pie pan on a Sunday afternoon. A slight bit of clove, a pinch of star anise, and a whole lot of caramel apple goodness all find themselves at home in this generous opening offer. The Apple Pie caramel is gooey, sweet and a touch toasty. It’s the expansion pack to the flavors of the beer, hammering home the sweetness but giving it an edge imparted by the salty caramel. It’s like a direct infusion of liquid cinnamon apples into the palate, and the beer mellows the sharpness with the warmth of the boozy carbonation. After the saccharine caramel, the Dapper Apple drinks more like a nut brown or a mellow pale than it had previously, the sweetness tempered by the superior sugar of the sweet treat. We move further into bold flavors with this round. The almost-astringent roast of the Quakertown quickly quashes any lingering apple flavors, replacing them with heavy chocolate and nutty notes. 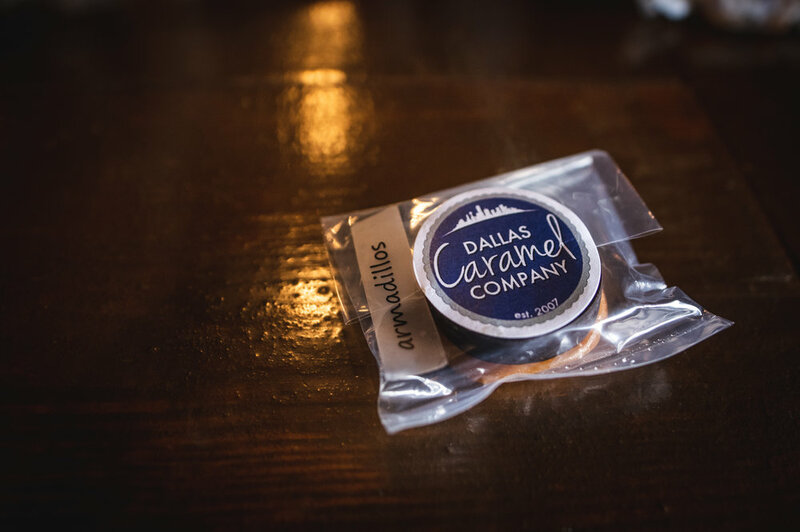 This latter flavor comes to light in the pairing, with the aptly named Armadillo caramel taking two of the beer’s main elements — nutty pecan and dark chocolate — and weaving them into the caramel motif. The chocolate itself is a stark contrast to the ooze of the caramel, providing a tough resistance that evokes a cookie or crisp biscuit-esque texture. 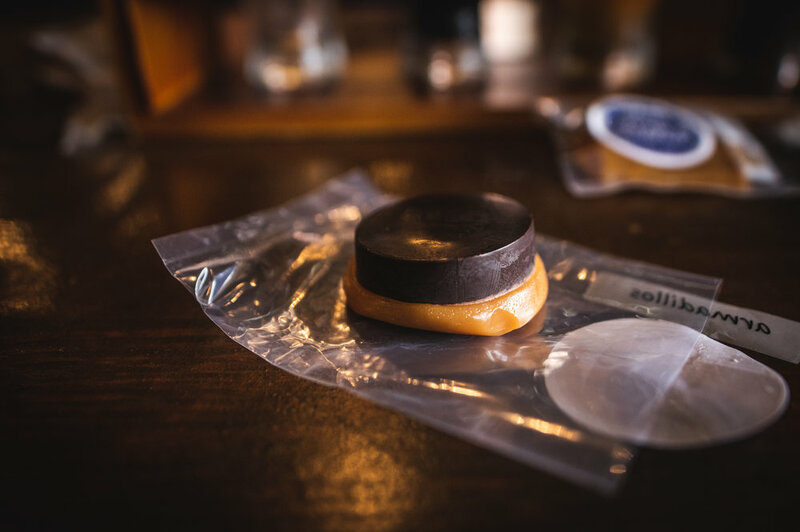 In opposition to the previous combo, this sweet treat actually emboldens the beer even more, creating a flavor rift that enhances both the dark beer and the sweet candy. The surly chocolate in the beer is drawn forward for a nice cacao finish that lingers nicely on the tongue, coating the mouth. The beer retains its heavy flavor, but the caramel allows this intense initial sip to fade into a delightfully chocolate bite. After the beer, there’s a leftover fudge-like flavor — like those fudge popsicles by the pool, and the caramel playing the role of that solid-but-soft ice cream filling, just begging to drip away into the summer heat. 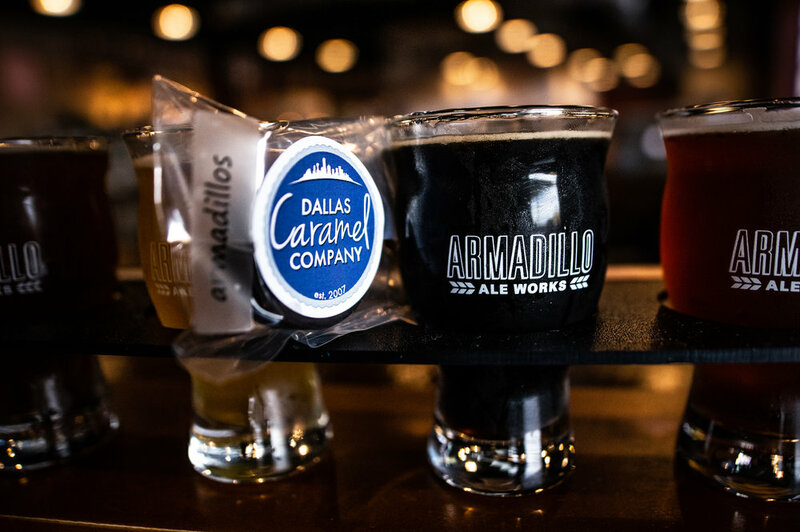 One thing among many to appreciate about these micropairings that Armadillo has crafted are the wild cards thrown into the mix, and this is no exception. When one sees “caramel,” one can see a few other elements thrown in — chocolate, nuts, etc. ; but, unless delving into caramel’s close cousin, taffy, one does not expect to see fruit involved. Alas, the Land Yacht IPA — furthest from the sweet flavors of candy, especially caramels — comes paired with a Lemon Meringue caramel. The Land Yacht is bitter but without clinging resin or overtly juicy citrus. Instead, the two are balanced in a mellowed, piney offering. The citrus is subtle but evident, and it’s on this note that we want to leave the palate as we dive in. The caramel hardly betrays its fruity addition in appearance, and even at first bite, the creamy lemon flavor takes a second to blossom. 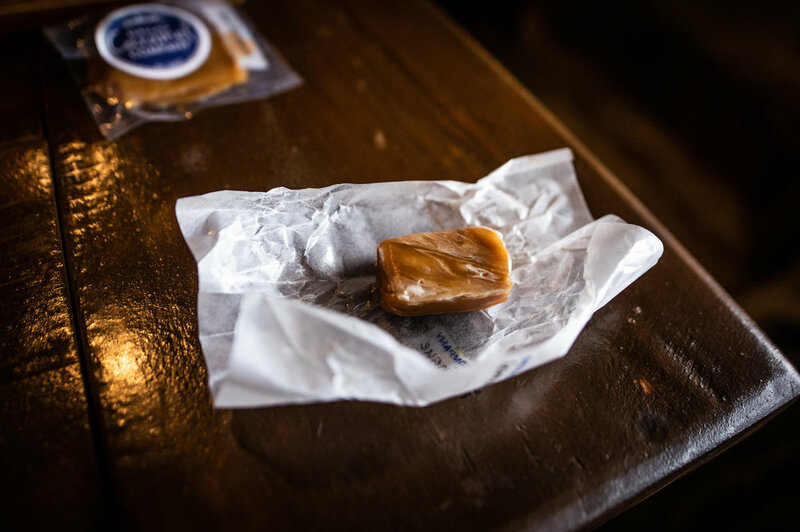 But it does, and with gusto — lemon subsumes caramel to take the place of honor on the taste buds. As if an equation, the lemon sweetness actually cancels out the citrus in the hops, allowing the hophead purist to really cut through to the unbridled flavor. The caramel acts like a hop sponge, overwhelming the bitterness to create a tempered lemon that is not far off from its namesake, and the overall pairing certainly takes on a creamier character in the spirit of the meringue. The Winterstellar is a return to the beginning of this little number: slight cinnamon, cardamom, and spiced fruity notes. It’s warming like a mulled wine, with a slight toasty note — not unlike the homey vibes of the first beer in this pairing, the Dapper Apple. The beer-infused Tumbleweed also has an interesting textural addition — nuts, presumably pecans, added to create a nice earthy crunch to the affair. 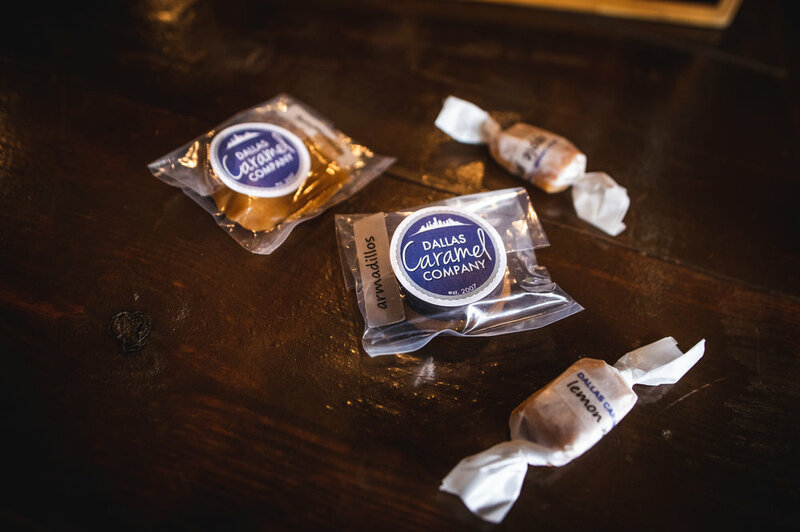 It’s pecan pie in candy form, and the beer brings just as much to the table: like a festive pie to be shared around the hearth, with kith and kin, holding out as the last vestiges of winter slowly give way to the renewal of the fields in the coming spring. The beer actually reveals a sweeter note in itself after a post-caramel sip, the nutty caramel benefiting from the boost. And with that we left as dazed and joyous as if reliving our first trip to a candy shop, having tasted new flavors and combinations — and, of course, in search of the right local food to satiate the hunger that these tasty morsels inspired.